If you are looking to gift rich, creamy, and sinful chocolate towers and baskets, look no further than the all popular Godiva brand. Just about any chocolate lover will perk up when they hear the name “Godiva.” This chocolate powerhouse has been providing some of the most luxurious selections of chocolates for years. While most people know about their truffles (and coffee), few know that they also have signature gift baskets. These baskets are overflowing with Godiva born and raised confections that are perfect for the chocolate lover you’re buying for. A chocolate powerhouse selling gourmet gift baskets. If you expect to find non-edible spa gift baskets or gifts for your pet at Godiva, you will be very disappointed. After all, chocolate isn’t man’s best friend’s ideal treat anyway. That being said, there is plenty of variety within this tight niche of a gifting category – and can you go wrong with chocolate? The Godiva gift baskets include items like their signature truffle flights, dark chocolates, gold ballotin, milk chocolate caramels, milk chocolate truffles, chocolate bars, truffle bars, hot chocolates, limited edition chocolates, chocolate biscuits, ornaments, and more. Sure we wouldn’t mind seeing more variety as a whole – instead of a lot of baskets that seem to repeat the inventory but just offer larger sizes. But, they are a chocolate company so expecting them to venture out of their chocolate brand is a little unreasonable, which is why we are not holding it against them. Customization is limited with Godiva, and you cannot create your own chocolate gift basket with them. You can add personalized ribbon and cards, but there is no swapping out items or adding on to the basket. You could always purchase extra items separately and put them in there, but this may not work for someone that is having the basket delivered straight to their recipient. Themes are somewhat non-existent with Godiva baskets, but not in a bad way. Most chocolate gift baskets can be used for just about any sentiment, so they don’t feel the need to specifically pigeon hole their baskets into a theme or sentiment. They do still have baskets that apply to all sentiments, such as wedding, thank you, etc. They also have holiday-inspired baskets that are wrapped with ribbons and paper to suit the holiday (such as gold and reds for Christmas). They do not offer vegan, sugar-free, Kosher or gluten-free specific chocolate gifts at this time. Godiva is a chocolate super power, so you would naturally expect to find great options for companies that want to gift their chocolates – and they meet that expectation. They offer high quality chocolate gifting and have since 1926. Corporate baskets are available and they also offer corporate discounts. During the holidays they offer even better sales and promotions for business buyers – including up to 25% off. The inventory and options for corporate buyers is not as extensive, but suitable nonetheless. Personalized business gifts are also available for those that want to add some branding to chocolate gift baskets. They have a dedicated VIP customer service specialist line for corporate buyers as well. There’s no doubt about the price comparison: Godiva will cost you more. Compared to other companies that offer somewhat similar baskets (and sometimes even include random Godiva selections), they are on the pricier side. Most of their baskets average from $60 to $375. While we do understand that would turn some off, for a basket full of Godiva chocolate you are not going to find anything budget-friendly. Instead, you are paying for the superior quality that this brand is known for. Unlike other types of gift baskets, you don’t have to expedite or upgrade shipping for perishable reasons – you will if you are in a hurry however. Their standard ground rates range from $7.95 to 6 percent of the total. To add on second day or next day delivery, the shipping rates go up considerably – averaging anywhere from $19.95 to as much as 15 percent of the net merchandise total. While they ship fast, they don’t offer same day shipping or delivery. Packaging is rather expected with Godiva. They use their signature bags and boxes (the same you see in stores too) and then place them in a tower with ribbon or in a basket. You can include a gift message, but overall, there is nothing that stands out – other than the overflowing chocolate of course. 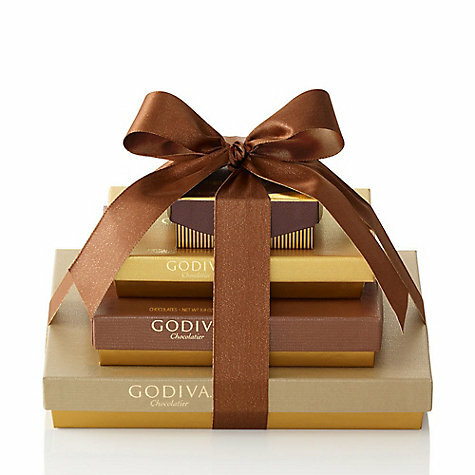 Godiva holds themselves to a higher standard than most companies, which is why they have one of the easiest return policies to deal with (and read for that matter). If someone isn’t satisfied, they just have to call, complain and Godiva will make it right. Period. They offer prompt replacements, refunds and exchanges all up to the customer. Customer assistance is refreshing with Godiva. Just as you would expect from a large corporation, they offer phone, email and even live chat. Customer service is available 8am to 11pm EST seven days per week too. The Godiva website is not accredited and they have several profiles on BBB – one of which carries an F rating based on just two complaints. We are not sure whether it was because the company simply did not respond or they just have two complaints. But, it is something to consider when ordering nonetheless. Considering we have contacted Godiva ourselves and spoken to their friendly, knowledgeable staff, the rating with the BBB does not influence us as much as it would when we too have had a negative experience. $50 to $100 – Baskets within this price range include things like 8pc. chocolates with 4 pc. truffles, solid chocolate bars, caramels, etc. $100 to $200 – These baskets are much heartier and typically contain 10 or more products including things like 12 piece truffle collections with chocolate gift boxes, bars, cocoa, truffles and more. $200 and up – These are the baskets for the chocolate lover or a large group and contain large packages of chocolate. One basket could include is 6 pieces of truffles, 105 pieces of chocolate, 36 pieces of holiday chocolate, 32 pieces of truffles, six pieces of truffles, 36 pieces of biscuits, 24 pieces of dark truffles, one large caramel bar, one large chocolate bar, and 10 ornaments. Godiva is ideal for anyone looking for a chocolate gift. But, the shopper will also need to be willing to pay the extra price for the Godiva brand – which means they better have a recipient that knows, loves and appreciates all there is to these little chocolate gems. Who doesn’t love chocolate? 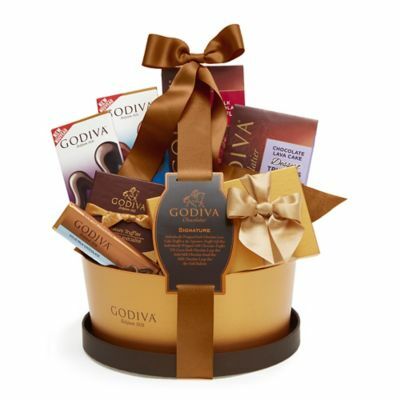 Godiva’s baskets are fun and they are packed with a lot more chocolate than meets the eye. Considering the baskets are packed full of nothing but Godiva exclusives, that isn’t too bad either. It is hard to find fault in a company that has baskets full of chocolate, but if we had to pick it would be the higher shipping rates – especially for those ordering a $375 basket that could cost them $22.95 for ground shipping and as much as $42.95 for overnight delivery. Fine chocolate and tons of selection. $50 to $100 - Baskets within this price range include things like 8pc. chocolates with 4 pc. truffles, solid chocolate bars, caramels, etc. $100 to $200 - These baskets are much heartier and typically contain 10 or more products including things like 12 piece truffle collections with chocolate gift boxes, bars, cocoa, truffles and more. $200 and up - These are the baskets for the chocolate lover or a large group and contain large packages of chocolate. One basket could include is 6 pieces of truffles, 105 pieces of chocolate, 36 pieces of holiday chocolate, 32 pieces of truffles, six pieces of truffles, 36 pieces of biscuits, 24 pieces of dark truffles, one large caramel bar, one large chocolate bar, and 10 ornaments.